Painting in watercolor since she was 15, teaching watercolor since the mid-1970’s, is it any wonder that this artist lives on a small island surrounded by water? For the past twenty years, Caroline Buchanan has lived on Obstruction Island, a small, non-ferry island less than a mile from the Olga end of Orcas. She and her husband, Jeffrey Unterschuetz, have carved a charming enclave. They are two of only six winter residents and for many years were the only ones. Getting the mail, the groceries, coming to the Artworks means crossing the water, often in her Whitehall rowboat. Her life is her art. She sees the water and islands from a boater’s perspective. A walk from their dock is past rugged rocks and stately firs. Caroline¹s watercolors reflect the peace and calm one finds in the islands. She received a BA with honors in Art History from Wellesley College and a Masters in Teaching in Art(specializing in teaching adults) from Western Oregon State College. 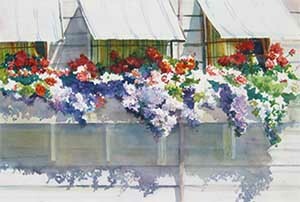 She is a Past President, Vice President, and Board Member of the Watercolor Society of Oregon and a Signature Member of the Northwest Watercolor Society. Her paintings are in corporate, private, and museum collections. invitational workshops, and in her own watercolor program. In addition, she has published articles and had articles published about her in American Artist Watercolor Magazine and Daniel Smith’s Inksmith. Aegean light. She has led other trips to Costa Rica, Cornwall, and Provence. State ferries. The islands are still a world away – quiet, a place to center one’s self and focus on one’s art. Buchanan’s work is known for the clarity of her colors, the balance of her designs and the depth of her feeling. She hopes to capturethe essence of a subject and to use watercolor in a way that reminds the viewer that this is painting first, implying the representation of reality.